Tinuku - A small robot arm scoops up breakfast cereal from one of four bowls built into a small tabletop platform and raises the spoon towards a man's mouth in a demonstration of a hands-free eating tool. The demonstration was taking place at the annual Rehabilitation Equipment Expo in the Vancouver suburb of Richmond on Tuesday. 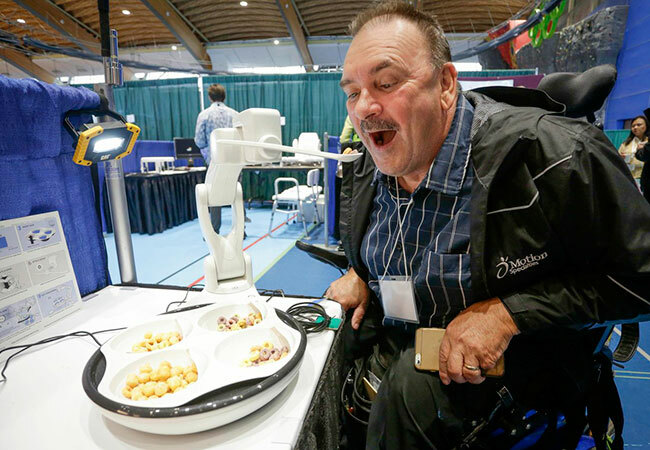 The event brings together more than 100 makers and sellers of disability tools and services, including rehab beds, chairs, lifts and robotic tools like Obi, the breakfast feeding robot. Ian Denison launched the expo about 22 years. The physiotherapist wanted to create a one-stop shop where other therapists could find the latest and most technologically-advanced tools and services for their disabled clients. "We started with 23 exhibits, now we're up to 106," said Denison, noting that everything at the showcase is either made or available locally. Shows like this are clearly needed in Canada, a country where more than 5.3 million people live with some form of a disability, according to Statistics Canada. Almost 16 percent of Canadians have some kind of disability that impacts their mobility or quality of life. About 80 percent of those disabled Canadians require some kind of specialized equipment. Denison said technology in healthcare is keeping more people alive who have severe disabilities, while also improving their lives. But that technology is becoming more affordable, more accessible and more automated. "When I started in rehab 30 years ago, somebody might have been in bed for two years because we didn't have the technology to allow them to use a power wheelchair because they were so disabled," said Denison. Now, more people are able to access tools and chairs that have made the world available to them again, he said. And expectations of quality are rising. One such example is the Velox chair. The motorized wheelchair was designed with six wheels, each with an independent shock absorber. "Vibration is detrimental to the human body," Ryan Batke, Velox's owner and sales manager. "We've reduced vibration with a foam configuration upwards of 40 percent over (other manufacturers), and with a pneumatic configuration we're upwards of 60 percent less vibration than anybody else. Globally, we are the smoothest mid-wheel drive chair available, hands down," Batke said. The chair is tilted back and elevated about four feet off the ground atop a set of mechanical arms. A smart phone is plugged into one of the arm rests, playing music. Batke said the chair can be raised up or down allowing the user to easily reach something above them. The chair can also be tilted or adjusted to relieve discomfort. 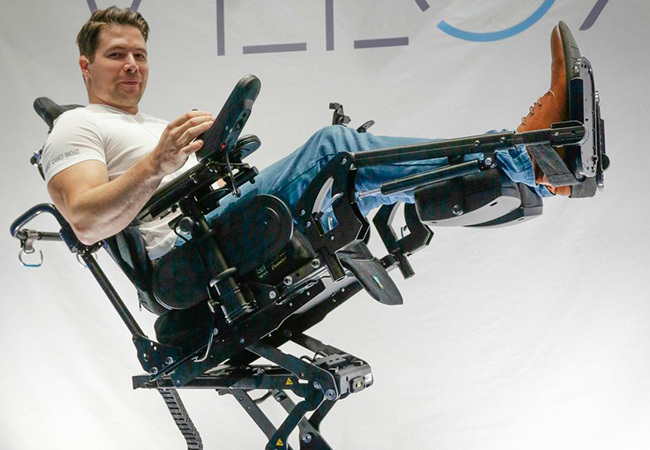 "We have a myriad of leg-rest features to really help splay the body out and relieve that pressure, Motorized chair tech has taken a big leap in recent years. The big thing that's going on right now is in software," said Batke. Chairs like this one can be equipped with a GPS signal that alerts someone if and when the chair breaks down. Batke said the Canadian population is aging and more disability tools will certainly be needed in the near future. "They actually have that integration in the systems and that helps keep people safer when they're driving around and with quicker response times. We're trying to get out in front of that wave," said Batke.